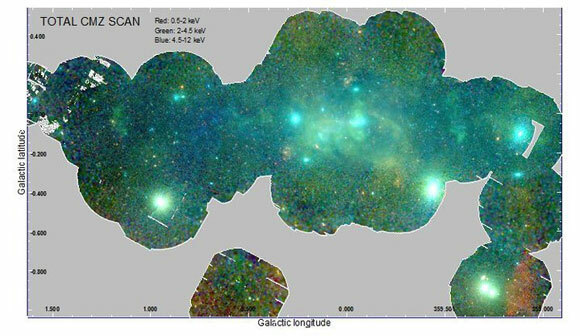 Glimpse into the heart of the Milky Way: this X-ray broad-band mosaic image consists of more than a hundred individual XMM-Newton observations within the central degree of the Milky Way. The colors indicate observations at different energies; this map covers a region about 500 hundred light years across. In addition to the X-ray emission from the regions around the supermassive black hole at the center of the Milky Way this map reveals X-ray binaries, star clusters, supernova remnants, bubbles and superbubbles, non-thermal filaments and many other sources. Using the XMM-Newton X-ray Satellite, astronomers from the Max Planck Institute observe the events around the black hole at the center of the Milky Way. Who left the deep scars on the heart of our Milky Way? In their hunt for elusive clues that might reveal the culprit, an international team of astronomers at the Max Planck Institute for Extraterrestrial Physics has been scouring cosmic images of the X-ray satellite XMM-Newton. The prime suspect is the supermassive black hole lurking at the center of the Milky Way. But a number of massive stars and supernovae do not appear entirely innocent, either. 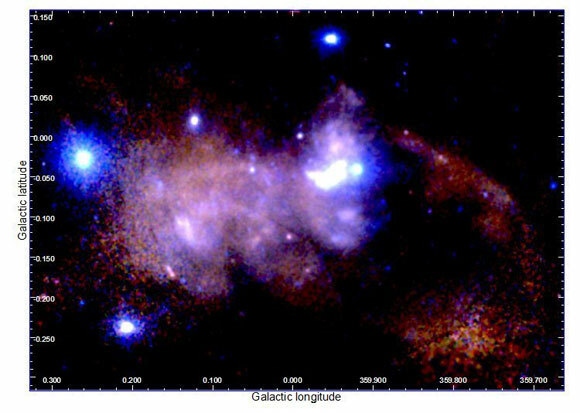 The study of the X-ray emission from the Galactic center is of primary importance for astronomy. One of the first large projects approved and performed by the X-ray satellite XMM-Newton, right after launch, was a scan of the Galactic center. A team lead by scientists at the Max Planck Institute for Extraterrestrial Physics (MPE) has recently obtained a new scan with XMM-Newton and connected these observations to all archival data to obtain the best maps in both X-ray continuum and line emission produced so far. With this, the team was able to characterize in detail the fallout from catastrophic events that have released vast amounts of energy. The forensic study led in particular to the discovery of how enormous X-ray emitting bubbles of plasma, tens of light years across, are impacting their environment, creating giant cavities in the gas, dust and cooler plasma at the Milky Way’s center. One of the most telling clues from the X-ray images is a pair of bipolar “lobes” that extend for tens of light years above and below the Galactic plane and are centered on the location of the supermassive black hole. Previous circumstantial evidence had implicated the black hole in this mayhem, but the new findings effectively catch it and its stellar gang red-handed in the act of committing acts of violence. In fact, the sources of matter and energy needed to inflate these bipolar lobes with hot, X-ray emitting gas could be either outflows launched from very near the event horizon of the super-massive black hole, winds from massive stars orbiting around the hole, or catastrophic events associated with the death of massive stars close to it. Magnified image of the central 100 light years of the Milky Way center, where here only the soft X-ray emission is shown. The Galactic black hole and its surrounding emission are located in the brightest central region of the image, and the bipolar lobes appear above and below that location. The team also discovered fingerprints of warm plasma in the outskirts of the imaged region (hundreds of light years). This indicates that the acts of violence taking place at the center of the Milky Way have effects that extend far beyond that region. The newly discovered plasma might be associated with an inhomogeneous hot “atmosphere” of hot gas permeating the Galaxy’s central regions, perhaps fed by continuous or episodic outflows of mass and energy from the Milky Way’s core. Similar structures are occasionally observed at the centers of other galaxies. However, thanks to the proximity of the Milky Way center, the XMM-Newton maps can directly image this phenomenon in superb detail. Another major disturbance in this unruly region has also been discovered: a few “superbubbles”, gigantic cavities tens of light years across that contain hot plasma emitting soft X-rays. One such region has an energy content of at least 1051 erg (approximately the total energy emitted by the Sun in its 10 billion year lifetime)! The evidence indicates that this enormous structure was inflated over the past tens of thousands years by powerful winds from the most massive stars of the spectacular Quintuplet stars cluster and by catastrophic events such as explosions of massive stars. Such large energy releases have a profound impact on the evolution of interstellar matter at the Galactic center. So, while the crime scene reconstruction is still being pieced together, with these new X-ray images the astronomers have a much clearer idea of what might have happened over the past couple billion years – and how our Milky Way might continue to evolve in future. One thing is clear: the violence in the neighborhood of the Galactic center will undoubtedly continue well into the future. 2 Comments on "XMM-Newton Views Turbulent Events at the Center of the Milky Way"
I wonder if Al Sharpton is gonna blame all the violence in the center of the galaxy on the Confederate Flag. All this violence seems like a good reason for us to stay away. On a less frivolous note, does all the activity in the area result in uneven distributions of mass and energy that could disturb orbits and increase the flow of material into the central black hole?